The 90-minute feature film established a groundbreaking event distribution model that gave fans the opportunity to experience the film on multiple platforms over three weeks in December 2014. 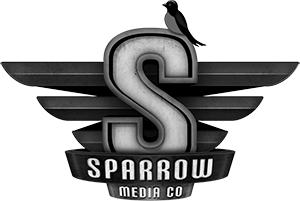 The forward-thinking innovative project engaged viewers in all regions of the country, promoting Canadian content and supporting homegrown talent. 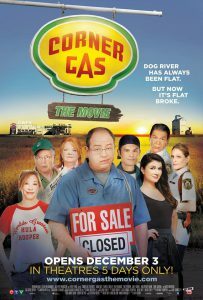 Each platform offered audiences an exclusive CORNER GAS experience during the holiday season, including a Cineplex Front Row Centre Event, followed by premieres on CTV, CTV Two, The Comedy Network, The Movie Network, CTV GO, CraveTV, and a DVD/Blu-ray release. The result was maximum exposure for fans across the country and astonishing audience engagement: more than 7 million TV viewers: over 130,000 video starts; tens of millions social media impressions; sold-out theatres across Canada; over 60,000 DVD and Blu-ray units sold. The series aired on Superstation WGN in the US and in over two dozen countries worldwide. It became a Canadian cultural phenomenon, spawning two chart-topping books, sold-out comedy tours, a successful line of clothing and merchandise, a top-selling series of DVDs, a Christmas special and song, dozens of notable guest stars, including two Prime Ministers and a thriving tourist industry in Rouleau, Saskatchewan, where CORNER GAS was filmed on location. Corner Gas: The Movie is an inter-provincial co-production produced by Corner Gas The Movie (ON) Inc. and Corner Gas The Movie (SK) Inc. in association with Telefilm Canada, Bell Media, Cineplex Entertainment, Tourism Saskatchewan, Creative Saskatchewan, Canada Media Fund, Cogeco, Ontario Media Development Corporation Film Fund, the Bell Fund, Canadian Film or Video Production Tax Credit, Ontario Film and Television Tax Credit Program, and Prairie Pants Distribution Inc. CORNER GAS is distributed worldwide by Prairie Pants Distribution. The collector’s DVD and Blu-ray is distributed in Canada by Video Services Corp. (VSC).